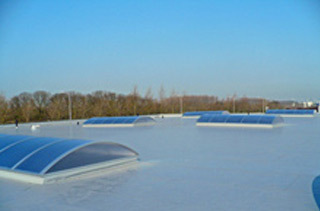 Armourplan SG is a polyester fleece-backed PVC membrane suitable for partially or fully adhesive bonding to flat or sloping roofs. Armourplan SG sheets are fully bonded to the substrate using Spectrabond Low Foaming PU Adhesive or IKOpro Sprayfast FMA Adhesive. Lap joints in the sheets are welded with a hot air gun. Armourplan SG fleece backed PVC membrane can be installed onto plywood, OSB / timber boarding, smooth concrete, profiled galvanised steel (with suitable overlay), woodwool slab or PIR Insulation.